Nectar can be defined as a sugar rich liquid, produced by nectaries. These are special glands in a plant, generally located at the base of the perianth. The word nectar has been derived from Greek word “nektar” that means ‘overcoming death’. Some plants can get pollinated by wind or water so they have no reason to produce this liquid but they do produce tiny pollen grains. This rich liquid provides a nutrient source to animal mutualist. This sweet and viscous secretion from the nectaries attracts fruit eating bats and other insects. It is the raw material used by honeybees to produce honey. All flowers do not need pollen to reproduce so they do not have it, but all of them have nectar. 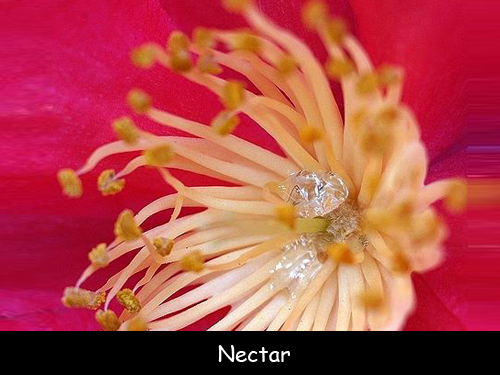 There are three types of nectaries: – floral nectaries, septal nectaries and extra floral nectaries. Nectar provides immediate energy to the insect, bat or bird for their own metabolic process so that they can fly to the next flower. Generally nectar is composed mostly of sucrose but a little amount of fructose and glucose as well. This composition can vary from one species to another. Some plants do not have nectaries in their flowers. These plants create a food resource for insects, most preferably ants to keep themselves protected by herbivores. East Africa’s whistling thorn acacia is an excellent example of such plants. Nectar, a watery solution of 55% sucrose, 24% glucose and 21% of fructose can also contain all 20 amino acids, alkaloids, vitamins and oils. Plants have various strategies to attract pollinators. Declan, Tobin. " Fun Facts for Kids about Nectar ." Easy Science for Kids, Apr 2019. Web. 18 Apr 2019. < https://easyscienceforkids.com/all-about-nectar/ >.